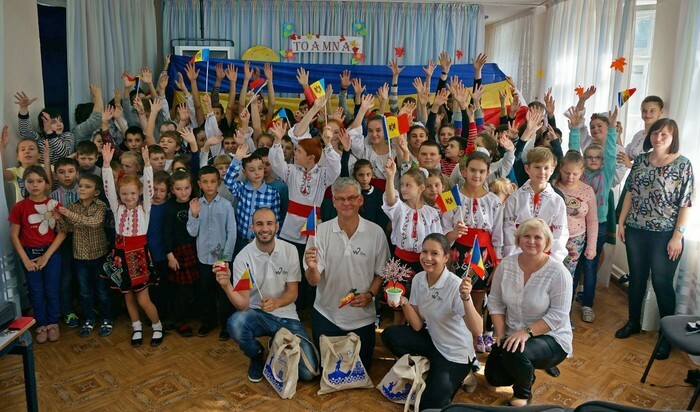 Two Sonova staff members helped out as volunteers on a Hear the World project in Chisinau, Moldova. Their goal was to install the Roger systems that Hear the World had donated, to calibrate new hearing aids and to guarantee subsequent care. In mid-October 2017, two Sonova staff members helped out as volunteers on a Hear the World project in Chisinau, Moldova. Their goal was to install the Roger systems that Hear the World had donated, to calibrate new hearing aids and to guarantee subsequent care. A total of 93 children with hearing loss attend Special School No. 12 in Chisinau, one of Moldova’s three schools for children with hearing loss. The first two Sonova volunteers travelled to Moldova in March 2017 to calibrate hearing aids and to equip the first schoolrooms with Roger systems, donated by Hear the World. Around half a year later, another two Sonova volunteers have made the journey to Moldova: Evert from Phonak Switzerland and Suhail from Sonova Israel. While in Moldova, Suhail calibrated new hearing aids for 30 children. During these calibrations and the subsequent check-ups, Luyba, who works at the school in Chisinau, was looking over his shoulder. After following all of Suhail’s explanations and processes with great interest, she was able to take over from the volunteer when he left. Suhail also organised a Friday information event for parents, to let them know how to handle and clean the hearing aids. It is common for children at the school in Chisinau to have profound hearing loss. In order to enable them to hear better, Hear the World has donated not only hearing aids, but also wireless microphone systems that help children with hearing aids to understand their teachers better. The Sonova volunteer Evert was in charge of installing these devices. He patiently explained to each of the teachers how the devices work – and what needs to be kept in mind. The children were very grateful to the Sonova volunteers Evert and Suhail for all the work they carried out on-site. As a sign of their appreciation, the children prepared a show for the volunteers, in which they danced and sang. Dancing and singing are valued highly at this school. The children have already won many prizes for their performances.